Cesky Hosting Review 2019: Is Cesky Hosting a Good Hosting? Cesky Hosting is a very comprehensive website hosting provider. They have an excellent all-in-one package, which includes lots of great features, and an excellent uptime record. Founded in 2003, Cesky Hosting (Czech Hosting in English) is now one of the leading Czech hosting providers, with more than 5000 customer reviews from 25,000 customers. Not only have they won many awards for their services, but also they have a strong social media following. They manage more than 100 physical servers that are co-located in a Czech data center. Their main website is available in the Czech language, whilst the client support pages are also available in English. 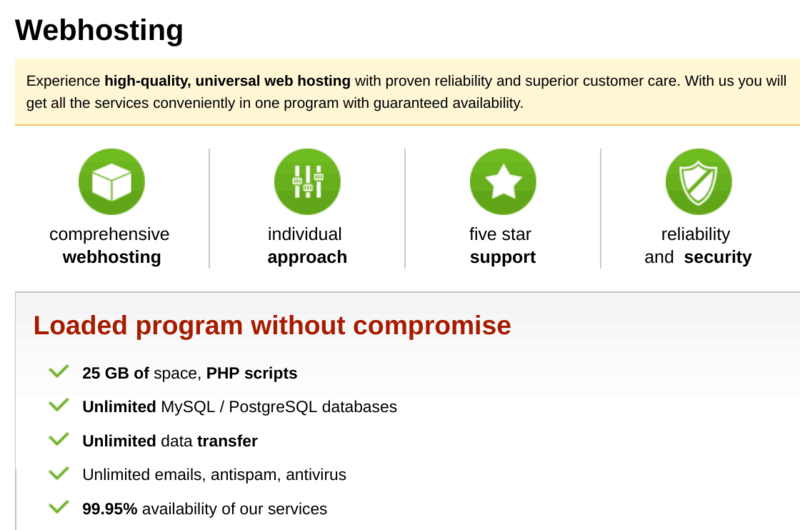 One of Cesky Hosting’s selling features is their “all in one” solution. Whilst it may be too simplistic for some enterprise-level clients, I really like it. They offer one base package of shared website hosting with everything they think you’ll need. The plan includes 25GB of disk space, unlimited data transfer (no doubt subject to “fair use”), and unlimited emails, antispam, antivirus and domains. Website statistics and daily backups are also included. They provide IPv4 and IPv6 addresses, a one-click installer (for an unspecified number of programs), and 24/7 monitoring. The plans come with PHP 7 (with the option to switch to earlier versions), Cron jobs, MySQL databases, and remote MySQL database access. They don’t support advanced coding languages like Ruby or Python. Whilst they don’t have an uptime service level agreement, they do “guarantee uninterrupted traffic for our web hosting services” and the long-term availability of their shared hosting services exceeds 99.9%. They use a Tier IV data center in the Czech Republic, meaning less than twenty-six minutes of downtime per year, and they have backup technology in a geographically separate data center. Cesky Hosting currently manages around 100 physical servers, which are monitored 24/7 and powered by Intel Xeon server processors and SSD drives for faster disk read speed times. They use branded hardware such as Intel, Hewlett Packard, and Seagate. The price you pay for the Cesky Hosting shared hosting plan is good considering it includes such good resource quotas and excellent features, and it uses a Tier IV data center. A Let’s Encrypt SSL certificate is included, whilst domain registration is an added expense. They only offer annual plans, but they do provide a fourteen-day free trial and a thirty-day money-back guarantee. In terms of customer support, they are great. They have live chat on their website, which is always answered promptly. I’ve never had any problems getting a quick and helpful answer to my questions. They also provide phone and email support, as well as a client zone for logged-in existing users; which – interestingly – is available in English as well as Czech. Cesky Hosting offers an all-in-one solution for shared hosting. Although they only offer one plan, it is feature-packed, has great uptime, and uses servers located in a Tier IV data center. Check out Cesky Hosting’s web hosting options today! Wondering how Cesky Hosting stacks up against other Web Hosting companies? Enter any other Web Hosting company and we will give you a side-by-side comparison.